The air in the shop is filled with the smell of cedar ribs steaming. Long coils of shavings pile up under the workbench as a cherry stem is being shaped for a new wood-canvas canoe. It is the first day of a canoe building course at Bearwood Canoes. An old barn, renovated for its new life as a canoe shop, lies right alongside the Seguin River near Orrville, and is the site of all this activity. 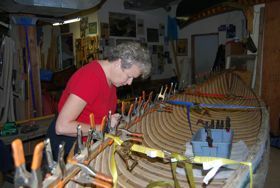 Pam offers hands-on courses in new canoe construction, repairs and recontruction at her shop near Parry Sound. She also has all women courses where women can learn new skills in a friendly and safe atmosphere. In this course, you will build your very own canoe and take it home by the end of the 9 days. No large group building one canoe, no raffle at the end. Your very own canoe, from scratch. It is a very full week, and requires a partner to help in construction - so I call it my ‘Partners’ or ‘Pairs’ course. All the components for the canoe are premilled and ready to go. The first afternoon you will bend the ribs, and then start planking the hull the very next day. By the fourth day, the hull is off the form, and by the 7th day it will be canvassed. By the end of the course, the canoe will have gunwales on, seats in, and stembands on. It will require painting and varnishing at home after the course. During the week there will be time to learn how to cane the canoe seats and learn some extra woodworking skills like tool sharpening. And hopefully even a bit of time for some paddling up the river. 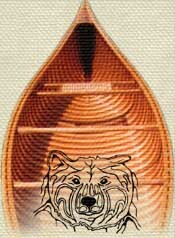 The course canoe will have white cedar ribs and planking, ash gunwales and trim, and hand caned seats. Other wood options are available. 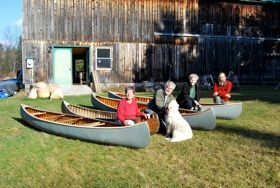 In this course, participants will be able to work on their own canoes, or cooperatively help each other as all the steps to restoration are taught. Canoes must be brought to the shop prior to the course for evaluation. Why come to Bearwood Canoes for your course? Besides working in the canoe shop, participants may take advantage of the meandering Seguin River for evening paddles or a quick mid-day swim. The Seguin Trail is close by for hiking and bicycling, as are hundreds of acres of adjacent crown land for wilderness exploring. Georgian Bay offers the chance for siteseeing on the 30,000 island boat cruise, or trying out kayaking among the windswept outer islands. The newly-formed Massassauga Provincial Park is a great canoe tripping area close by, and would be a wonderful way to finish up a holiday here. For further information on the Parry Sound area go to www.parrysound.com. Canoe construction: Here you will build your own canoe. Course cost, shop time, use of tools, instruction and all materials including paint and varnish, is $3,295 Cdn. Restoration/Repair courses: Course cost, shop time, use of tools and instruction is $750 Cdn. Materials are extra. from Miki Johnson on Vimeo. Here's a wonderful video by Miki Johnson, a photojournalist who built a canoe with her Dad in July 2011. Please check out her website. My dad and I spent 8 wonderful days building a wooden canoe from scratch at Bearwood Canoe near Parry Sound, Ontario in July 2011. This is a collection of moments from our time there.